Alash: Master Tuvan Throat Singers will perform at 4 p.m. Sunday, Oct. 25, at the Gloria Theater in Urbana. Alash are masters of traditional Tuvan instruments, as well as the ancient art of throat singing, a technique for singing multiple pitches at once. The performance is free of charge. A group of master throat singers will perform at the Gloria Theater Oct. 25. The Alash: Master Tuvan Throat Singers will perform at 4 p.m. Sunday, Oct. 25, at the Urbana theater. The performance is part of the 17th statewide International Music and Performing Arts Communities Tour (IMPACT), presented by the Ohio Arts Council. Alash are masters of traditional Tuvan instruments, as well as the ancient art of throat singing. Throat singing, a technique for singing multiple pitches at once. The small republic of Tuva is a giant when it comes to mastery of the human voice. 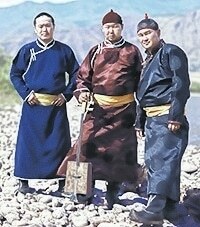 Throat singing has become Tuva’s best-known export. What distinguishes Alash from earlier generations is the subtle infusion of modern influences into their traditional music. The group will also perform in Medina, Marietta and Portsmouth as part of the tour. Urbana is the last stop. The concert is free and open to the public. IMPACT is presented in partnership with Ohio Arts Presenters Network and is supported by the Arts Midwest Touring Fund, a program of Arts Midwest, which is supported by the National Endowment for the Arts and the Ohio Arts Council. Additional contributions come from the Crane Group and General Mills Foundation. For more information, visit the Ohio Arts Council website at oac.ohio.gov. Submitted by the Ohio Arts Council.